Curiosity has been intense about what the company has been up to, especially as its CEO and founder Helen Greiner has a high profile in the robotics and defense community ? she’s one of the cofounders of iRobot, known internationally for both its vacuum cleaners and its bomb-fighting ground robots. Now Greiner has pulled back the curtain on what her new company has been creating. The company has developed two small unmanned aircraft, one a quadrotor, one a ducted fan. At first glance, that may not seem worth the secrecy. Quadrotors abound and can even be purchased in shopping malls. And ducted-fan aircraft, while a bit rarer, are not exotic. The new vehicles from CyPhy Works, however, have one major difference: They operate via a tether, or microfilament ? a thin strand of two copper wires. This allows them to operate for a nearly unlimited amount of time while sending back high-definition video. The ducted-fan robot is named EASE. EASE is intended to go inside buildings and use its offboard smarts to survey the area. 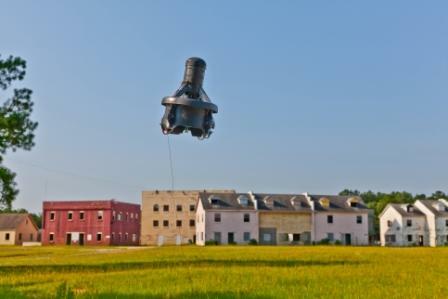 The quadrotor, PARC, is a beefier airframe that can stay aloft indefinitely, providing much-needed surveillance to remote areas such as forward operating bases. There are plenty of tethered robots under water, where they are known as remotely operated vehicles, but not many in the air. Israel Aerospace Industries has one, the ETOP, or Electric Tethered Observation Platform, and there is the French Rapace, a collaborative effort headed by the company Geocean. CyPhy Works’ offerings are intended to be both smaller and more flexible, like EASE, and offer greater altitude, through PARC. Greiner is best known for working with ground robots, but she says her transition to UAS with EASE and PARC isn’t as different as it might sound. She used to worry about what competition her ground robots could face and realized it was from air vehicles. “And the reason is they won’t be stopped by a fence, won’t be stopped by a ditch. They don’t have to go in through the ground floor or the doorway. “They can go in through a window, a second-story window, a third-story window, and when you’re going upstairs you don’t have to worry that the steps obey fire codes so the robot can get up. You’re just flying so you go on up,” she says. Rooms are often strewn with tables and other furniture that can put the brakes on a ground robot, whereas an aircraft can simply go around them. A second reason for moving into aircraft is that much of the technology being used on ground vehicles hasn’t made the transition to air yet, limited by the small size and light weight of vehicles that generally are powered by batteries and have relatively short flight times. Matt England, who deployed the first PackBots when he was in the military and now works with the company as vice president of military systems, says the microfilament gives a lot of capability. He says the tether allows for offboard power and much more robust offboard computing, allowing EASE to operate much like a flying soldier. It can enter a room and search it, using its computing power to report back only if needed. “Robots today have to be 100 percent operated by the sensor, the human. I would rather have the sensor have the autonomy to be able to do those tasks and help me as opposed to be a tool that requires my constant management,” he says. The tether “gives you the endurance to be as deliberate or as rapid as you want. It gives you the ability to work in GPS-denied environments, completely without hindrance or degradation in capability, and it gives the user or users the visual acuity that they really all yearn for,” he says. CyPhy Works came to the idea of the tether early on, Greiner says, as it wrestled with the core issues of how to get a flying robot inside buildings without sacrificing quality video, communications and power. Battery technology would not allow that, she says. The microfilament, in this case, two strands of copper wire, is sufficient to carry power to the vehicles and ferry high-definition video back. “The biggest problem with ground robots today is they send them inside a building, they go down the stairs, no comms, they go around the corner, no comms. You go into a bunker and it’s got some rebar and you don’t get comms,” Greiner says. The tether spools from the vehicle so it won’t get tangled. Should it happen to snag or break, the vehicle can use its battery power to fly back to its point of origin. The company started working on EASE first, but then got a “customer pull” from the military, to develop PARC. Forward operating bases at remote locations in Afghanistan currently use aerostats for surveillance, but they have a significant ground presence and enemy fighters can see when they’re not in use and wait to attack. They wanted something small, something that could stay aloft for indefinite periods of time. They also wanted more payload, which meant no existing systems could be used. “Our customers wanted to carry more payload than anything out there, so we had to build our own,” she says.